Even the most faithful, focused Christians can encounter periods of depression and spiritual darkness when joy seems to stay just out of reach. It can happen because of sin, satanic assault, distressing circumstances, or hereditary and other physical causes. 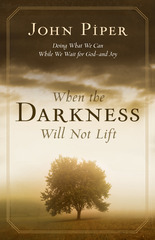 Readers will gain insight into the physical side of depression and spiritual darkness, what it means to wait on the Lord in a time of darkness, how unconfessed sin can clog our joy, and how to minister to others who are living without light. Piper uses real-life examples and sensitive narrative to show readers abundant reason to hope that God will pull them out of the pit of despair and into the light once again. to pick up your FREE copy!